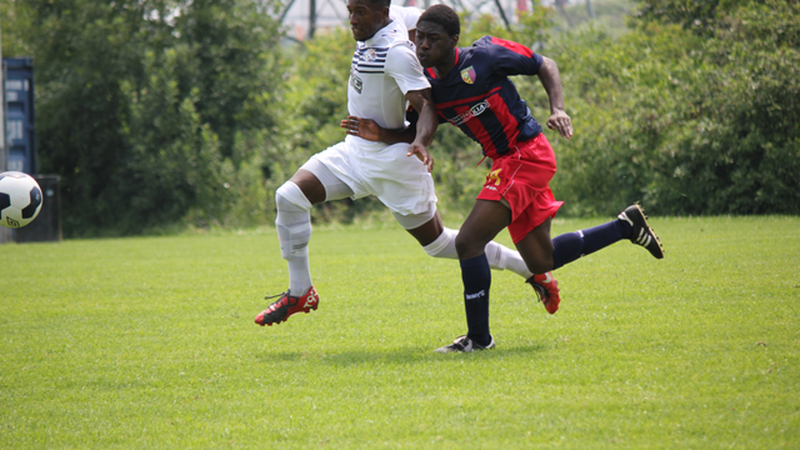 Le Rohne Young struck for three goals in eleven minutes to pace Durham United to a 4-2 home-field victory over Windsor Stars in League1 play on Sunday afternoon. Young, who had half-a-dozen chances to score got going early in the second half after the teams played to a largely uneventful and scoreless first half at Kinsmen Park in Pickering. But the goals came early and often after half time. The tall, lanky striker, hit the net in the forty-eighth minute behind Windsor keeper Anthony Santilli. Ciprian Codea came back with a header to get one past Ben Cowman in Durham's goal just four minutes later. The goal that would keep Durham in front for good was scored by Young off a sweet volley that kissed the post as it found the twine in the fifty-fourth minute. And Young capped his afternoon and a blazing hot streak by slotting home an easy pass from teammate Colin Francis in the fifty-ninth minute to make 3-1 giving him a hat-trick in just eleven minutes. After the game, Young admitted his teammates had given him some stick in the dressing room at the half over having missed a few chances in the opening half, but said he was determined to make up for it in the second forty-five minutes. "I think I started off slow, but when I got my head in the game, I got a couple and it feels great. My teammates gave me a little criticism but also said keep your head and go hard and that's exactly what I did. With a little perseverance and determination, we came out with the win," Young said. Windsor were actually granted a pair of penalty kicks by the ref on two yellow cards to Durham players, Nicholas Goddard and Le-Shaun Young, and went one for two from twelve yards. Cristian Dragoi of the Stars shot over the bar in the thirteenth minute, while Gino Berardi converted in the sixty-fifth minute to make the score 3-2. Also yellow carded for Durham were Hameez Farell (thirty-eigth) and Tristan Grant (forty-sixth). In added time in the second half, and with Windsor desperately pressing for the equalizer, Jordan Hargrave blasted a long ball from the halfway line into an empty goal to make the final 4-2. A very disappointed Windsor coach, Stefano Vagnini, didn't hide his feelings after the game, as his team fell to four wins, two draws and two losses for fourteen points. "When you're flat it's really hard to get out of. It's a shame, it's an absolute embarrassment the way we walked on to this field and off this field and the score proves it. "I think we got what we deserved, we were arguing, it was just an all-around let down. Since I've been with the Stars, this is probably the worst showing since I've seen these guys come on the field," he said. For Durham coach Tony La Ferrara, who saw his club win its second game of the season to go with three draws and three defeats for nine points, the result was "fantastic." "We play well all the time, we don't play bad games. We were saying to the boys, there is only one game that we were totally out of it. We're coming along slowly, we had some injuries but now we're getting everybody back." Durham's next match is at Kinsmen Park vs. Kingston Clippers on Friday at 8:30 p.m. Windsor head to the Hershey Centre for a clash with Sigma FC on Saturday at 4 p.m.